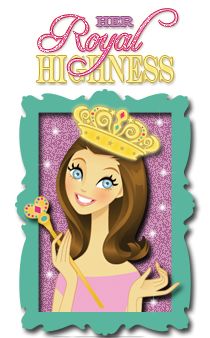 The Scrapbooking Queen: Peachy Keen & Miss Kate ~ Hey Chickie! Peachy Keen & Miss Kate ~ Hey Chickie! Hello Everyone! Happy Saturday, are you super excited ! 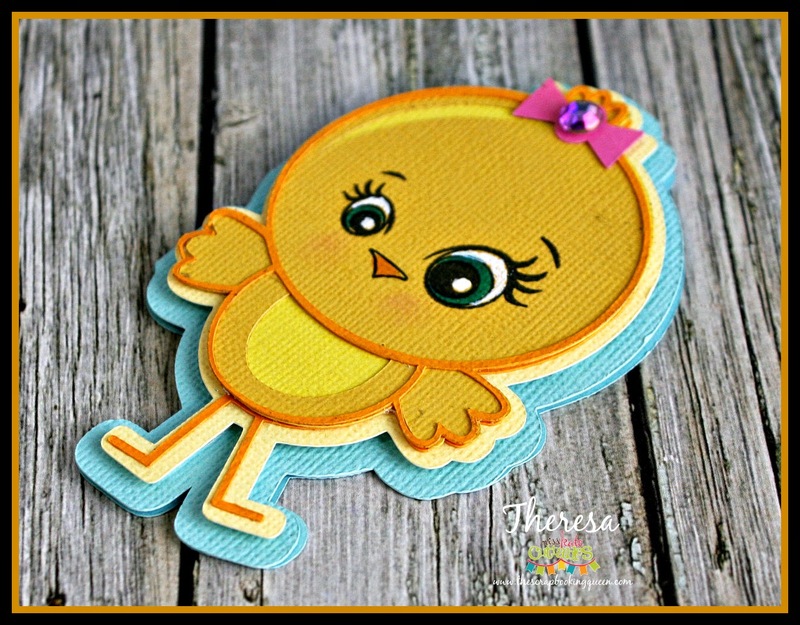 The Scrapbooking Queen is so happy today..
How cute is this girl chick MKC file called "Girl Chick"
worked and gave it a whole different look. All together now say it you know you want too! below for some awesome blog candy! 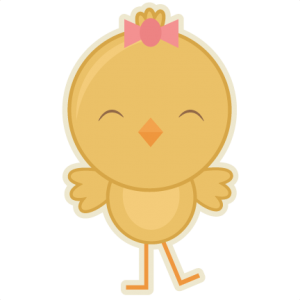 Love those new stamps and your little chickie is just adorable!! This is SUPER ADORABLE! That little chick is too cute and those are some of my fav faces too! Fantastic job! That little chick is so cute. Love her. I love your card! So adorable!! Love that cute little face! Even though the cut files are cute, they are even more adorable with Peachy faces. Your shape chick card is fabulous! Great job! SUPER cute!! Love the cut files you used. Your chick is so adorable. Love the face stamp! Adorable chick! Love the face. Thanks for the blog hop, looking forward to each day. Adorable! I have been a follower. That Peachy Keen Face is perfect for MCK little chick. So cute. Love it. This is super cute and I love the yellows that you used to make it. Love your little Chickie Theresa. It is awesome with the peachy keen face. That chick is too cute!!! Your little chick is sooo CUTE. What a fabulous hop!! Your card is just so adorable. Love that you made a shaped card and the Peachy face you used is so cute!! AWWWWW!!!! lol :) This is just the sweetest thang!!! 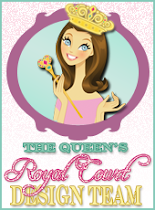 The Queen has done a magnificent job on this royally cute creation!!! Thanks so much for the awesome inspiration for todays co-hop! Have a great weekend!!! What a cutie. Loving these Peachy Keen stamps. Cute file, but the stamped face make it really cute. The little chick is so adorable. love your work. Super CUTE love the peachy keen's!!!!!! So cute! Love that chick!! I love, love, love chicks. My fav yet. Love your chickie!! I could see that on a wobble!! This is the perfect line up - Miss Kates Cuttables & PKS! Your little chick is simply adorable!!! Thanks for sharing! Such a cute little chickie! I love the little chick and her face is adorable. My first PKS arrived today! Thanks for the inspiration! I love how you have taken the Miss Kate Collectables chick and added your own touches and coupled the Peachy Keen Stamps to truely make this design your own. Thanks for the inspiration. What a wonderful combination of companies. PK makes any MKC cutout even cuter!!! Love those faces and use them all the time. Thanks for the hop and thanks for sharing! Looking forward to tomorrows inspiration! So totally cute!! What a fun way to change the look of the cut files, love those little faces!!! I just hafta tell ya I am a sucker for shaped cards! 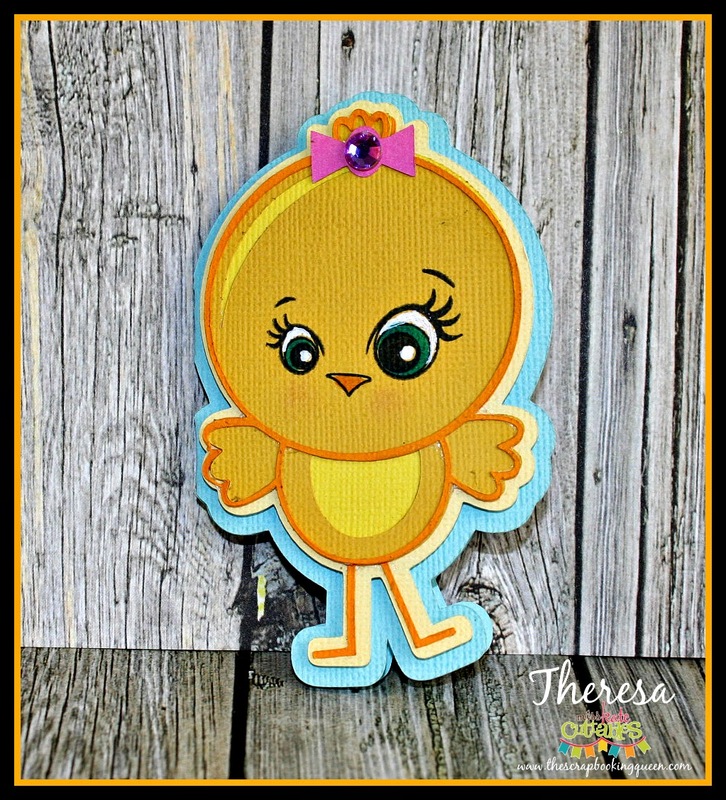 I am sure I will be using this super cute chick to make a few more Easter cards! I love these Peachy faces. They are on my Wanted list already!!! Theresa your project is adorable! This is adorable, love it...thanks for sharing..
super cute chick! those faces are adorable, make them look even cuter! What a cutie! I am already a follower, TFS Theresa! Wow, that really does make the chick even more adorable, thanks for the inspiration! Love the card! The chick is adorable! Cute little chick you've got there. Love it. So beautiful, thanks for the hop and all the ideas. You always have things in my style! I love this little chick and his face is adorable. Thanks. I think this face is just perfect for the chick! Such cute little chicks with such cute faces! I love this little girl chick! Super cute shape card. I'm a follower. Love the little girl chick. Adorable card! Loved the peachy face you choose:) This chickie card is going on my wish list. Love the layering its so spring like! What a cute little chickie! And that one big eye just makes his little face...LOL! Love it! Super cute chick!! Love her face, makes me smile!! Eeek! This is too cute! New follower. Very cute thanks for sharing. I Love chickie and he eyes REALLY have it!!! I am following you -- have for a long time! Love the little Chickie! Adorable! The chick and faces work perfectly together. Very cute!